SIP Trunking is a method by which an individual telephone system, or PBX, can substitute Internet or other data lines for traditional telephone lines. SIP stands for Session Initiation Protocol and is part of the panoply of Voice over IP (VoIP) technologies which are the foundation of modern telecommunications. 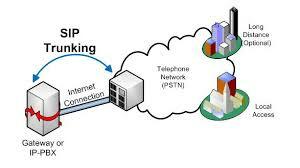 In SIP trunking, the telephone system establishes a connection to a carrier on a standard data line (typically an Internet circuit, although private data network connections may also be used) using SIP and this connection is then used to deliver telecommunications services formerly provided by traditional analog and digital telephone lines. Once the connection is established, many of the management and configuration principles used with legacy phone systems are still applicable, as is much of the terminology. This last point is essential to keep in mind, because it establishes SIP trunking as "just another type of line" for your phone system. SIP trunking is a change in the transport of telecommunications services, not a change in the services themselves. What are the advantages of SIP Trunking? For the individual business, two primary advantages are immediately derived from a migration away from legacy analog and digital telephone lines towards SIP Trunking: Flexibility and Cost. Legacy telephone lines have a physical limitation as to the number of communications channels available. An analog phone line provides one communications channel; a digital T1 or PRI line provides a maximum of 23 communications channels. If more communications channels are needed, more physical lines are required, which must be installed by the telecommunications carrier, generally at some expense to both the carrier and the customer. SIP Trunks have no such physical limitation. Because SIP trunking uses regular data connections, the only physical limitation is the bandwidth capacity of the connection itself. As a direct result of this, the number of concurrent communications channels available is largely a contractual agreement between you and your telecommunications provider, and that number can be scaled up or down based on the terms of that agreement. For example, consider the case of an hotel or resort that has a wide seasonal fluctuation in bookings and activity. During the seasonal peak periods, there is usually a far greater need for telecommunications services than there is during the slow periods. With SIP Trunking, the hotel can expand the number of concurrent calls to accommodate the seasonal demand, and then reduce the number again during the slow period to reduce cost. Such seasonal flexibility is not feasible with legacy analog and digital telephone lines. 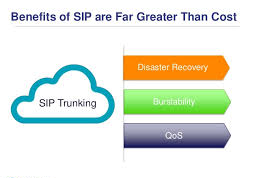 As a general rule, SIP trunks allow for significant cost reductions over legacy telephone lines. The primary reason for this is the flexibility described above: if a business needs 7 communications channels, it has to either purchase 7 individual analog lines, or purchase a digital T1 or PRI line, which will carry significant excess capacity (remember, a T1 or PRI is 23 concurrent communications channels). Even the digital circuit is provisioned to support just a fraction of the physical capacity, almost invariably the business is paying for capacity it rarely, if ever uses. With SIP trunking those excess capacities--which are wasted cost--disappear almost entirely. Moreover, because the number of communications channels is purely a contractual variance, there are fewer costs to upgrade capacity--for Voice The Right Way customers, there are no upgrade costs at all. Mobility -- SIP trunks use your Internet connection, but are not directly tied to your Internet connection. You can change Internet providers or even change physical locations with minimal impact, as the SIP trunks continue to use whatever Internet connection is made available. Disaster Recovery/Business Continuity -- A sad reality of life is that bad things happen. Natural disasters can disrupt your place of business for extended periods. With SIP trunking, your phone services can be quickly rerouted to alternate locations, allowing normal business operations to resume far quicker than would otherwise be the case. Better and more responsive service -- SIP trunk providers are not burdened by legacy infrastructures or legacy business practices. In addition to the technology providing you with greater communications flexibility, your SIP trunk provider enjoys greater business flexibility, being liberated from the demands of managing a complex physical network. Your SIP trunk provider will often be able to devise service packages and offerings that are more closely tailored to the needs of your business (e.g., all Voice The Right Way customers receive free outbound e-fax service as part of every service offering, and we frequently blend extensions "in the cloud" with dedicated SIP trunk services to provide services exactly where the customer requires them, when the customer requires them). "Virtual" telephone numbers -- Because SIP trunks are virtual telephone lines, they are better able than legacy telephone circuits to treat all telephone numbers as being equal. This means that a business can use phone numbers mostly without regard to geographic location. A business in Houston, Texas, can easily have a Denver, Colorado presence simply by mapping a Denver-area telephone number to their SIP trunks. This simple feature can greatly expand a business' effective reach into markets it might otherwise not be able to serve without investing heavily in local facilities. All businesses need to communicate; that will never change. What will change is the technologies use to make communication happen. Telecommunications is shifting--and largely has shifted--away from analog and digital telephone lines to VoIP and SIP. If your business has not yet made this transition, it will in the very near future. When that shift does happen, the most important thing to remember about SIP Trunking is that it is still "just another phone line."